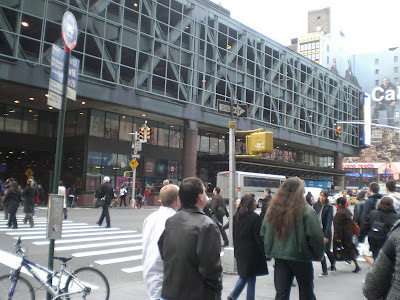 The Port Authority Bus Terminal, located on 42nd Street just west of Times Square, is the biggest bus terminal in the United States and serves more people than any bus station in the world, with over 7200 buses and 200,000 people passing through every weekday. For millions of people, the first steps they take in Manhattan are inside the Port Authority. The Port Authority sold the air rights over the north wing (pictured) in 2007 and soon a massive tower will rise above the terminal, to be completed in 2012. The area around the Port Authority used to be considered the most dangerous in Manhattan, but the gentrification of Times Square has turned the corner into a busy confluence of tourism and chain restaurants.